Hunter's Eggs, a variation on Pipérade, Thyme for Cooking easy gourmet. This is a variation on a Basque dish of peppers and tomatoes. It's a simple dish, with just a few ingredients but bursting with flavors. The name comes from two types of hunters in our fields this time of year: mushroom and wild boar. Clean mushrooms and slice thickly. Cut bacon, crossways, into strips. In nonstick skillet, sauté bacon until crisp. Remove and set aside. Add 1 tsp oil and onion to skillet. Cook, over medium heat, until onions just start to brown, 7 - 10 minutes. Add mushrooms and continue to sauté until mushrooms start to brown, 5 - 7 minutes longer. 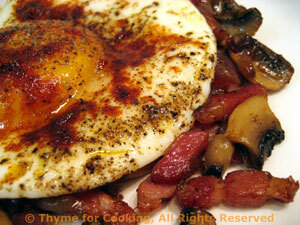 Return bacon to skillet and keep warm while cooking eggs. In separate nonstick skillet heat 1 tsp olive oil. When hot add eggs and fry, trying to keep a nice shape, just until the whites are set; they're meant to be 'sunny-side up'. Divide bacon/mushroom mix between two plates. Put an egg on top of each, sprinkle with paprika, pepper and serve.